Records from the first European settlers show the area around Lake Mattamuskeet to have “an abundance of fish and fowl”. Native American records also make reference to hunting for fowl using corn and “nightfire.” In the 1700`s settlers to the Hyde County region were farmers who in addition to agriculture, quickly became avid waterfowler’s early on for food, and then at the turn of the century for profit as tourism made its first appearance. According to agricultural experts in the 1900`s Hyde County Soil was the “richest in the world, and needed no fertilizer”. Productive Farmland, natural vegetation, flooded grain fields, and the proximity to pristine wetlands, and Lake Mattamuskeet made the Hyde County area prime grounds for Migratory Waterfowl. Nature, agriculture and wildlife. It is a delicate balance, and is managed by the state, and Federal Government, as well as local farmers and waterfowlers. *General info. Taken from Mattamuskeet and Ocracoke Waterfowl heritage by Jack Dudley. 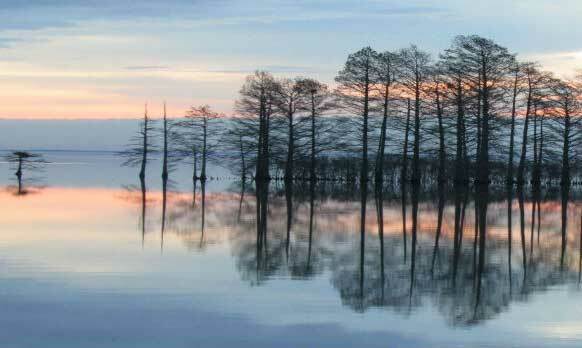 Lake Mattamuskeet the forefront of Hyde County Waterfowl Heritage is the largest natural lake in North Carolina. Lake Mattamuskeet is one of a number of lakes of unknown origin. Indian legend attributes its formation to a fire that burned for 13 moons. Originally the lake covered more than 120,000 acres, but as time passed, farmers became more and more interested in the rich soil, that lie at the bottom of the lake, hence came the construction of a canal from the lake to the sound, which once finished reduced the size of the lake form 120,000 acres to 50,000 plus acres. Fast forward to early to mid 1900`s farmers wanted access to the remaining 50,000 acres. After years of setbacks, finally came the construction of the Outfall Canal, which runs from the lake 7 miles to the Pamlico Sound, and later the famous Pumping Station, which became Mattamuskeet Lodge in 1937. For 37 years is operated as a lodge and gained a reputation as one of the favorite hunting lodges in the country. Over time the idea of farming the land where the lake is now, was finally abandoned, and was left to it`s present size, which is nearly 50,000 acres. At one time the lake and nearby area was considered as the Canada Goose Hunting Capitol of the World, and has been referred to as the “land of the huntsman`s delight”. Lake Mattamuskeet now comprises the big portion of the Mattamuskeet National Wildlife Refuge, which was established in 1934, and now winter`s, or is home to more than 800 species of wildlife and birds, during part or all of each year. Unfortunately, hunting is now only permitted on the lake by state drawn permits. If there are any changes to the number in your party, a two week notice prior to confirmed hunt date must be given to GGS Outfitters or you will be charged the full amount. Example: If you booked a hunt for 5 hunters and only bring 4, we will still charge you for 5 hunters unless you changed that number two weeks prior. Hunters are allowed to reschedule during the same hunting season if an opening is available. A hunt may be rescheduled for the following hunting season but is subject to rate and policy changes. Inclement weather may cause a hunt to be cancelled and subsequently rescheduled at GGS Outfitters’ discrepancy. Choose the date you would like to hunt. We will follow up with you to confirm your date is available. Available hunting days depend on weather, guide availability, and other factors.